Deluxe Reverse Osmosis Water Purification System. 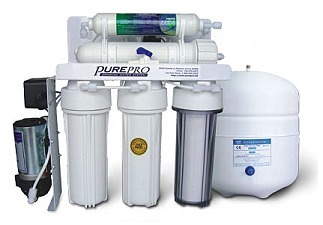 RO102 built-in flushing membrane technologies which can provides premium water quality. It can meets all your water quality needs. This system hides away under your sink and puts healthy great-tasting water at your fingertips. Our RO102 comes complete with a NSF certified 3.2 gallons water storage tank, NSF approved post carbon filter and all the necessary fittings, installation kits, extra color 1/4" tubing, and a ceramic-gate attractive faucet. We don't know any other system at our price that can approaches its performance.